Between God and the world of nature lies a bridge called the "occult". Crossing it is fraught with danger and a slip-up means falling into the abyss of idolatry. Most children are thrilled by stories of witches and devils, Harry Potter and Lord Voldemort. In an otherwise dry and rational world, those mysterious forces add an element of fun and excitement and stir the imagination. They allow a youngster to feel that there is a way to beat a merciless and insensitive system. Born poor through no fault of your own? No problem -- a wonderful fairy will come to your doorstep and give you the fortune you so longed for. A bully is tormenting you mercilessly? A spell will be cast and he will become a squirrel for the rest of his life. The Blair Witch Project films give teenagers a momentary shot of excitement and dread, and an ominous whiff that maybe there really is something lurking out there. When a person matures, three general approaches towards the occult and other outside forces begin to emerge. There are the serious, rational mindsets who laugh it all off. For them the world is rational, quantifiable and anything else is utter rubbish. There are people who sense that the world has a spiritual dimension with mysteries that reason we can't comprehend. There is a second group of people, who tend to be spiritual, artistic, poetic, etc. They sense the world has a spiritual dimension to it, and that there are all sorts of forces and mysteries that reason can't comprehend. Theirs is a world of tea-leaf readings, tarot cards, crystal balls and psychic predictions. Then there are those very deeply religious people, whose worldview is that of a great battle between the two forces in the world -- good and evil. The captain of the good team is God, assisted by a host of angels, saints, martyrs, etc. The captain of the bad team is the devil, assisted by demons, evil spirits and politicians. Their world is particularly threatened by the likes of Harry Potter books, due to a large degree to the severity with which witchcraft is dealt with in the Bible. None of these three general approaches are in keeping with Judaism. What is the Torah perspective regarding witchcraft? But why? What is the problem with it? The so-called "devil vs. God" approach is an anathema to Judaism because of the whiff of dualism inherent in it. God is One, and only One. He acts in many different ways, but there are no "two" armies in the full sense of the word. Judaism does speak of the "Satan/devil," but it sees Satan as an agent of God, testing the sincerity of man's deeds, the strength of his convictions, and the stamina of his moral fiber. Although this so-called devil seems to entice man to do wrong, he is not inherently an evil being. Rather, he is conducting a "sting" operation; overtly enticing to bad, but in reality working for God. A cursory reading of the beginning of Job conveys that message: God sends out Satan to test Job's righteousness. Just as a dentist or doctor tests the firmness of a bone or flesh by probing it, just as the army tests the integrity and trustworthiness of its intelligence agents by tempting them, so too does God test man. A test reveals the inner worthiness of a person's deeds, demonstrating what they are really made of. So, if magic and occult do exist, why are they so evil? We also find mention of many types of "good magic" in the Talmudic sources, such as blessings, amulets etc. How do we distinguish between the two types of spiritual forces? The perspective most widely used is that of the Nachmanides, the great 12th century thinker. We will try to adapt and explain his perspective. Although God was the sole creator of the universe, He created an autonomous system of "nature" that serves as an intermediate layer between God and man. The system of nature is self-contained and has its laws and its causes and effects. Being that one can use this system without immediate recourse to God, it allows for a sort of atheism. It is easy to think that the system runs on its own, independent from God. Gravity, inertia, electro-magnetism etc. all work whether the person is a sinner or a saint. A person who buys into the phenomena of nature, without bothering to ask himself about their cause, nor being sensitive to God's manipulation of natural events, is misled by the system into disbelief in God. The world of the quasi-spiritual has the ability to bend the rules of nature through miracles and magic. Between God and this world of nature lies another bridge, which we shall call the "occult" or the quasi-spiritual. It has the ability to change and bend the rules of nature, through miracles, magic, etc. But this quasi-spiritual world, although it is more elevated than nature per se, is still not the Divine. It has its rules and laws of operation, and is perhaps more powerful than the physical world, but certainly not omnipotent. Are we to make use of this world in the way which we are bidden to make use of the physical world? Nachmanides says that generally speaking God does not desire that we make use of this world. God had intended for us to come to awareness of Him within the natural world, and through its phenomena. Someone who subverts the system of nature, by constantly using the supernatural world, is going against the will of God. In those instances where holy people have used forces above nature, they've always emphasized the fact that the miracles thus generated only demonstrated God's omnipotence to override natural phenomena. This is similar to (though certainly not the same as) the miracles that God performed for Israel in Egypt with the aim of establishing certain Divine truths. When a righteous person occasionally uses Divine intervention, it bolsters those great truths. It is at this point that the danger of real wrongdoing exists. A person who has realized that the laws of nature onto themselves are insufficient to explain the world, has tapped into this more spiritual world and come upon a melange of all sorts of "spiritual beings." If he understands they are agents of God, this becomes a true spiritual experience. But if he mistakenly understands them to be independent of God, then he engages in idol-worship! These forces then become a source for evil when they are viewed as an alternative power to God. Did the serpent heal or kill? Rather, when Israel looked up heavenward, and dedicated their hearts to their Heavenly Father [they would be healed], and when not, they would waste away. Here we have both facets of the supernatural: At first, the miraculous nature of the snake caused people to realize that the plague was God's doing, and they worked on bettering themselves. In this vein it was a positive spiritual experience. But later things disintegrated and instead of the snake being a means to recognizing God, it became a focal point in itself, i.e. the wonderful healing snake -- separate from God's power. That is idolatry. For this reason, many hundreds of years later, King Hezekiah had this copper snake destroyed because people turned it into an idol! Idol worship is the perception that there are many forces with various powers over mankind and perhaps even over God. The idolater thinks that he can use these "powers" against God if he only knew how to wrest them away from God. It's as if God's power were vested in a gun He holds in His hand. The idolater thinks that if could only wrest the gun from God, then he'd wield that power. He equates the spells of witchcraft with the ability to overpower God. The prime example of this thinking is the evil prophet Bilaam, who is called a sorcerer by the Torah. He was a person very knowledgeable in this area of the universe. He kept scheming to use the world of magic against God. He thought he understood the mind of God and that with enough powerful manipulation, he would be able to outfox Him! In a sense, this is the worst form of idolatry possible. On the one hand, the person is onto something "real." It is not a weird looking rock that a primitive mind has fantasized into a god. Rather, it is a power that works. Yet, it is utterly false, because nothing is independent of God. The litmus test of "spirituality" is morality. Without morality any "spirituality" is bogus or evil. For us, the litmus test of "spirituality" is morality. Any form of "spirituality" that makes no moral demands on a human being, that does not seek to bring him closer to God, or bring out the Divine potential of man, is bogus or evil spirituality. If a person practices "occult rites" and the content thereof is a mumble of strange words, bizarre costumes, or strange rites, it is either bogus or evil. It usually is bogus, but in those cases that he has tapped into these powers, it is evil for he has divorced it from God. The great rabbis who performed supernatural acts, were using them to bring home a message about God. They enjoined people to recognize the Creator, develop their character, be kind to others, be honest and faithful, reign in their drives, etc. Understood in the larger context of God, Torah and morality, these unusual miracles were indeed Divine revelations. Evil cannot be real unless there are supernatural beings that are against God, in rebellion, working against him. Otherwise there would be no reason to test. If the Devil only works for God, then what happens to those who fail the tests? Good but missing clarity about such movements as spiritualism & spiritual healing [- including Reiki -] which tend to have a very moral structure but still don't necessarily attach themselves to G-d. Excellent article and very timely. I am printing it so I can pass it around to all of my friends and family. Please continue to speak out on subjects such as this. I think you are missing the big picture when God bans witchcraft on pain of death. You are trying to rely on a spiritual force other than God. That is idolatry - in direct opposition to commandment #1 and #2. When you come to that point, (s)he has already made a conscious decision not to rely on God or worship God. The bronze snake is a specific mathod that God used to demonstrate His salvation and is not any kind of sorcery, witchcraft, or magic. I don't think the theory of additional layer than nauture is very plausible. I have to disagree with Nachmanides on this one. The power that Bilham had cannot be associated with Avodah Zara. It was a power given to him by Hashem which Bilham could use for good or evil. Avoda Zara is something completely different, as in that case the power was believed to be resident in the object of Avoda Zara, whereas Bilham acknowledged that he could only do what Hashem would let him do. Asheros are considered Avodah Zara. Bilham, although a sone Israel, was given profetical powers by Hashem to applacate any objection from non Jews that if a man of the greatness of Moses would be given to them, they would do tschuva. They got Bilham. and the advise to offer Sacrifices at the mount of Zofim. This indicates that, had it not been for Hashem's desire to keep Am Israel, they would have been destroyed by Bilham. These powers are not Avodah Zara, as they were directly delegated to Bilham, who knew the source of the power. This is an excellent article. I would like to bring up some other info too. There are many mystical societies like the Rosicrucians who stress purity and morality along with the study of mysticism. In their otology, they believe that things which most consider "occult" are really metaphysical and have no basis in the "spirit world". Things like telekinesis are merely not understood, but not necessesarily "spiritual". I think that there are many parallels in today's society for "occult"-like thinking, i.e. the medical society. People very often look to doctors as those people in King Chizkiahu's time looked at the snake. And what about how today's society looks at money? The fantasy world of Harry Potter is a lot less harmful for most because it's clearly fantasy. Medicine and Money, however, are looked to as magical, and that is more of a problem in daily life. Hashem sends the money and the healing, but we forget this and spend long hours at work thinking we will get more that way, or running from dr. to dr. thinking that they cure people. Hashem decides these things, and we forget. We have to go through the motions, but because we all go through the motions, this is more of an issue than occult. What about the use of talismans, amulets, and good luck charms? Is their use allowed? for themselves and then choose life. world be content with Him and His ways. I look forward to the day when Halloween and occult books are no longer the norm for our young. Bless Aish for their willingness to tell the truth! The kind of "witchcraft" present in the Harry Potter novels is a harmless bit of fantasy. It is not any kind of agent of real devilry, other than the fact that Lord Voldemort is quite evil. But even he is not the agent of any darker force; he IS the dark force incarnate. Any great plot requires a great villain, and that's all he is. He is motivated not by hatred of God or a rejection of God, but by simple shallow ambition. One can say that Rowling's novels do not perform any particularly great good, but they certainly perform no evil. They are highly entertaining, they have inspired millions of children to take up the habit of reading, they present a compelling tale of courage against great odds - what's really so wrong with that? I'm one of those rational people you mentioned, who tends to look to science for most answers. I spend a lot of time trying to balance my Judaism with my scientific and historical outlook. I don't see anything the least bit threatening to either from my interest in science fiction and fantasy. I had hoped to read what can be done to aid an individual who has been "hexed" by a sorcerer. for starters not all tea leaf readers and tarot card devotees believe in some higher "occult" power. most of it is for entertainment purposes. its not as if tarot cards are one step away from dancing naked around a bonfire. and kids (as well as adults) enjoyment of stories that employee witchcraft, magic and other fantasy like worlds are also for simple entertainment and interest. i can't think of something more boring than reading a book or watching a movie about the things that the masses do day in and day out. most people much rather bite into a mystery, a fantasy, a peek into a world that is not our own. seeing sinister and anti-G-d messages in these entertainments is the product of paranoid minds that cannot seperate the real threat from the imaginary ones. harry potter isn't the enemy. don't Jews have enough real threats and enemis to keep us occupied as it is without making up new ones? Some years ago I was a member of a magical order, which used ceremonial magic within a kabbalistic structure. The point of magic (briefly) is to achieve mastery over the self and the outer world to the degree where one becomes identified with god. The problem with it is that it turns my will into god's will so that I become god and so I end up deifying myself. This is in complete contrast with the Torah, where God is seen as infinitely higher and more powerful than created beings. We are called to accept the will of God and His commands: "make His will your will". Having left the path of magic and lived an observant life, I am very happy to say that I would rather be a talmid Torah, howver humble and ignorant, than a magician. This was extremely helpful, re understanding the "occult"
G_d given and can co exist with regular religious devotion, validates what I feel and is one of the most satisfying essays I've received in my year or so of subscribing to aish. Your article reflects a non-Jewish fear of the so-called "occult." The Gemara is full of "occult" type occurences or remedies. To confuse these with Hollywood depictions of the spriritual, or with xtian hostility (in which Jews were killed as witches) ignores a large part of our tradition. For more, see "Magic of the Ordinary" by Rabbi Gerson Winkler. HOW COULD YOU ASSUME THAT THOSE OF US THAT ARE ARTISTIC OR MORE SPIRITUAL ARE MORE PRONE TO TEA LEAVES AND PSYCHICS? I TRULY TAKE OFFENSE TO THAT. I FEEL MY ARTISTIC AND SPIRITUAL ABILITIES ALLOW ME TO SEE WHAT GOD HAS CREATED IN A MORE INTENSE WAY. YOUR GENERALIZATIONS HAVE ATTACHED A SIGMA TO WHAT I FEEL IS A BLESSING. Beautiful and convincing article.. Thanks! What can I add to your words? I can not add much. I hope and pray that mankind will one day wake from its' death, its' separation from the love of HaShem and His Light, HaTorah L'Chaim. I once was a Christian. I had values and ethics very similar beliefs to Jewish ones. I thought I knew the Messiah in a personal relationship, etc., etc. What I found was that I was guilty of hate, and worse, idolatry. I had caused the people of Israel harm and had no understanding of the words of the Nazarene. I was blinded by pagan tradition, etc., etc. I went through a time of wrestlings as Yaacov had done. What I finally realized was that there is only one Higher power, His name is actually nameless except that which can be spoken with the heart & soul. I finally realized also that the deity of a man is not even what that man was actually teaching. He was talking as IF he were the Torah. Had his words in that kind of context been deified by the goyim instead of falsely applying their pagan theologies to those things, We would've seen the age of Moshiach a long long time ago. Deify the words of the Tzaddikim and you will see its' because they have been speaking the Torah of the Mighty one of Israel all along. Shalom! There is no "quasi-spiritual". To say that there is, is to deny the idea that the Almighty is omnipotent. If sorcery can occur it occurs because G-d allows it if G-d ever wanted it not to occur he could stop it. Also we must remmember that the "psychics" of today, who claim to have been born with some sort of extra-sensory perception, assuming that they are not lying, have been given this talent by G-d.
Good article. It's amazing that so many people after reading it are still asking "what's wrong with occult, wicca, magic, etc?" Well, to put it simple, it's like cheating on an exam: trying to use shortcut instead performing your task. Occult, wicca, magic, etc. are so popular in America for the same reason as any other "quick fix" or "magic pill" - either for a soured relationship or for treating simptoms instead of the actual disease. G-d brings us to the world so we would work on our spiritual growth by controling our base desires and behave in all life situations according to His Torah, but we would prefer to resolve our problems with magic, "turn Arafat into a vegetable" and go back to our business as usual - watching TV, cheating our wifes and lying to our shareholders. But maybe Arafat our "wake-up call"? The Ten Commandments have lost their vitality. Conscience is a Jewish invention; it is a blemish, like circumcision..." Adolph Hitler. This was truly a well written article, but I found it very disconcerting that it needed to be written in the first place. One sort of thinks that all the Pagan beliefs died off in Western Society some time ago. I personally thought that the beliefs in the doctrines of Science and evolution were the �idol worship� of our generation. Science is not just the understanding of the way nature and all things physical function (which is an intellectual pursuit) but the way the academics and proponders of various theories attempt to further us from the belief of a Devine being to have been able to create all we perceive. The thought is too restricting and mind boggling and doesn�t allow one to go beyond a certain limit (although they too must realize that they have a limit�.what happened before the Big Bang and how was that material in existence anyways?!) With the development of various other theories and forms of worship one is attempting to shirk off the responsibility to obey G-d�s commandments and conform to a certain way of behavior and morality (besides obeying a code of laws). In other words if you don�t believe G-d exists then you have no responsibility to behave in any certain way besides the way you see fit. Responding to Anonymous 4/8/�01 , what makes you think that the Sun worshipers or moon worshipper�s were not peaceful and good people. Anyone who is awestruck with the greatness of the creation is obviously a thinking and even civilized person. People who worship anything in nature are missing the point. All the beauty around us was created in order to help us exist and cause us to be aware of the greatness of our Creator. To worship the servants of the King is not just foolishness (and missing the point) darn right ingratitude and even scornfulness! How would your Mother like if you patted the wash machine on the lid every time it did a load for you and not thank her? In the Mishnah a very seeming harsh statement is made: Whoever interrupts his/her learning and comments on a tree and says how pretty is this tree is a Mishchayev BeNofsho ( liable for his own soul ). Why ? because the whole purpose of creation is to bring us to a primitive awareness of G-d but the Torah is G-ds word and part and parcel of G-d-and to lose hold of that fact by announcing the beauty of Nature means you didn�t even get the point. You�ve missed the point. You�ve replaced the Divine understanding with the primitive-and thus forfeiting the Jews whole reason d�entre! (of course this doesn�t mean a Jew can�t stroll in the park and admire creation-but it�s the when he/she is doing it. Not in the middle of being in the �inner chamber�s of G-d world and communication with Him through learning or prayer). As for David ben Rafael�s post; David the first half of your post sounded fine but you must know that Moshiach is not a security blanket concept. It is part and parcel with true Torah beliefs. Deny Moshiach or the need for him and you are denying the whole truth of the Torah. I would think that this concept would be as clear as the light of day in the times we live now. We occupy Israel and although there is not enough accord in the community every Jew shares a love for Israel. But being in a land and sharing that love has not saved us from the troubles we are not experiencing with the Bnei Ishmael. Neither is there any real hope of getting out of it using any worldly means. It�s not like fighting WWII where all you needed was a good army and good weapons and allot of man power. That won�t help here and every solution only brings with it even worse problems. Moshiach is meant to unify all Jews in service to G-d (not just as a group of people living in their own country) and teach us the ways to serve G-d and help us improve the entire Spiritual situation for the Jewish people and the world. There is no current leader who can do this and it would need a highly Spiritual person and special in all ways to unify our nation. The existence of Moshiach and his coming have been preprogrammed into the creation of the universe and thus essential for it�s survival. This is the will of G-d and nothing has changed since this concept has come into being (even though we now live in the 20th century with Pentium 4 computer�s and the possibility of Mach 8 transportation! Question: What about the people who seem to have been born with the ability to connect with this dimension? The article mentions people who are involved with "..Theirs is a world of tea-leaf readings, tarot cards, crystal balls and psychic predictions..". But what the people who seem to be born with a sixth sense, who do not try to delve into the dimension, but can't avoid it? The connection is thrust upon them. How are they suppose to view themselves, and how are they suppose to act? I was happy to see this article addressing witchcraft on your site. As a religious community I think it is important to tackle these issues. Today, especially in popular culture, witchcraft and occult practices are made to seem okay and even inviting to young people. Recently I went to a local bookstore and was appalled to see how many books in the childrens section were about teen witches, the history of wichcraft and other occult related titles. As a small child, I had brushes with this form of evil, through an older female babysitter of mine who owned a ouiji board and a Satanic bible. She also introduced me to a few "harmless" satanic games as well as astral projection, something that another commentator mentioned. If you have never experienced these things, I DO NOT recomend trying them, they fly in the face of G-d and are extreamly EVIL and we are told not to have anything to do with these things or the people who practice them. There is no room for grey area in this subject. I have experienced firsthand the absence of G-d in these practices. Make no mistake about it they are EVIL. �Between God and this world of nature lies another bridge, which we shall call the "occult" or the quasi-spiritual.� Quasi-spiritual would infer that you view all of these things as childish, and imaginary. If you were to study and perform Astral Projection, you would *know* that there is a large piece of reality that Judaism, and the rest of the world, completely ignores. For the record, Rambam (Maimonides) said that the occult is complete nonsense. It is evil and forbidden not because it works, but because it misleads people into thinking that there's a way "around" G-d.
One implication of the "supernatural" is that there are forces which are beyond our control and, therefore, over which we have no power. This, perhaps, is the result of a belief of a conflict between independant forces of good and evil, rather than a belief as expressed in the article. If, however, some such conflicts exist internally rather than externally, that is, within ourselves, we have the ability to influence at least some forces of good and evil. (Obviously, there are some matters over which we have no power, such as someone shooting another.) Where we do have such ability, it can be argued that this stems from man's creation where God left it to each of us, as individuals, to strive to perfecting ourselves. In addition, in opposition to those saying that we have no power to avoid the supernatural, we even can argue with God (Abraham, for example, did so) but, perhaps within confines, and produce a positive result. Question, if you do not believe in evil, how do you explain Hitler? Do you believe he was an agent of God or of evil? When I was in high school I became involved with a group of Wiccans who taught me a lot about their beliefs, etc. I was impressed, and considering becoming Wiccan, but the whole double deity thing always bugged me. The leader of the Wiccan group encouraged me to examine my own faith first. The more I looked into it, the more I realized that Judaism offered everything I wanted (and needed) and all the rationalizations I created (the god and goddess are really just two halves of a whole and things like that) were pointless. My perception of Judaism had been shaped by what Christians said about G-d and how Christians thought Jews viewed G-d. In the absence of any Jewish education from my parents or others, I had missed out on the broad subjects and subtle thinking Judaism encompasses. My point? If you are Jewish and have become or are considering becoming Wiccan, Buddhist, or any other religion, look deeper into your own people's past. There is a rich enough store of philosophy, spirituality, and practical common sense to make replacing it with anything else seem absurd. Other religions are fine and possibly just as valid-- for others. As Jewish people, though, we have been given a wonderful gift, crafted to our unique needs, that ought not be tossed aside lightly. It should be obvious that magic tricks are just sleight of hand, and that occult practices are fraudulent. Belief in the occult is simply foolishness. It should also be obvious that midrashim (haggatic stories) which seem to attribute supernatural powers to rabbis in the Talmud, must be interpreted as allegories. Latter-day tales that tell of rebbes that perform miracles are simply fiction. My two cents. What can you say to today's teenagers who consult tarot cards, ouija boards.etc because they "don't believe in a magic giant in the sky"? What are they saying they actually DO believe in? Could you also discuss the role of angels in Judiasm? What�s the difference between sorcery and Kabbalah? I was told that when the Rabbis of the Talmud performed super-natural acts such as creating a living calf out of clay, this was only after a process of perfecting themselves as Tzadaikim and studying Torah for many years. They performed these acts with God�s permission. Sorcery, on the other hand, is trying to tap into these same forces without God�s permission. If you like, gate-crashing God�s world! Many so-called Kabbalists that say that one can study Kabbalah, divorced from Torah and even without belief in God, are not Kabbalists at all. They are sorcerers! As you are reading the attraction to Wicca and the occult is rampant, especially amongst the youth. This is very disconcerting. After such a clear and conconsise article somehow many still have the impression these other religions are "good", "sanctioned as OK" within Judaism. Just a reminder to the commenters: G-d calls playing with such things an "abomination" and the author does a wonderful job sharing this point. DON'T PLAY WITH THIS STUFF. The witchcraft in itself is like spitting in God's face. We know that there is a spiritual world around us. But God specifically tells us not to put anything before him. If we want something supernatural to happen, ask God for it. By going to some other form of power (such as witchcraft) we are saying to God that we don't think that He can solve our problems/needs so we will take it upon ourselves. It is a lack of faith in God. The deity is NOT a genie to be brought forth by rubbing a bottle. The intelligence that designed the human nervous system, that created atoms and solar systems is not a simplistic "mystical" entity to be manipulated. Witchcraft, sorcery and Judaism do not go together. And remember Judaism is the ONLY religion that does not worship a human being, living or dead. The whole concept of "Moshiach" is what kept us from Israel for millenia. We need no "Moshiach" -- we need only obey the laws of the Torah. Not an interpretation of the laws -- the literal statement. The creator is a master of the simple declarative sentence, "DO This..." "Don't do that..." We must stop adding to his laws as well as subtracting from them. When the creator appointed the Levites and the sons of Aharon, he left no margin for elitism in Jewish society. We need no kings and we need no moshiach. We have Israel and we have the one deity. Now all we have to do is unify our community -- for the purpose of the laws is surely to bring harmony to the community. When we act as one, no power on earth can stand against us. This is an excellent article!!!! I think this should be required reading in all temple and synagogue Sunday schools throughout the world. Kids can get into trouble with their fascination of the Occult.....and can be dangerous....just look at Columbine High School. 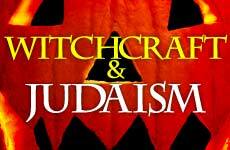 Parents need to be aware of this Jewish perspective on the occult and witchcraft. While Torah is very specific regarding witches and idol worship, I am afraid that your explanation seeks to simplify the issue by combining three very different practices - witchcraft, idolatry, and magic(k). Torah is replete with examples of each and its position is quite clear regarding each - when taken in the specific context in which it is presented. Idolatry is anathma to Jewish practice and I exclude that from this response. However, contemporary Wiccans practice presents a very peaceful, and non-threatening pagan relegion steeped in a respect for other humans and for nature and natural events. Magic(k)borrows heavily from the Kabbalah and other mystical Jewish mainstays. Intent in magic(k) as well as in Judiasm is important. A knife can do good or do evil. It all depends on who holds the weapon and how it is wielded. I believe that lumping them together does each a disservice and further clouds a full understanding of biblical intent on three very significant religious and historical philosophies. I am a Jewish teen girl. I am not Wiccan, nor any other similar Pagan religion, but I am very interested in it and a few of my personal beliefs about the world and life are represented by Wicca. Wicca is modern form of witchcraft, but that term is largely misunderstood. Just because someone is a "witch" does not mean they are evil, and it does not mean that they worship Satan. (That's actually the religion called Satanism, although there ARE some Satanists who believe in Satan as an idea or force, not the actual "devil.") Wicca, and other similar religions, are VERY peaceful nature religions. They do believe that the world is full of positive energy that can be shaped with spells (much like a prayer in other religions, like Judiasm) and that there is a God and a Goddess, representing the masculine AND feminine aspects of the world. Some WIccans believe in the God and the Goddess in a more literal sense than others. The code of ethics in Wicca is very clear: And it harm none, do what ye will. I think it is terrible that so many people make judgements about Wicca, and many other things in daily lives, before we really know anything about them. This is very simple but very helpful to me to understand.I have been wondering about the new age practices and this article has help me to show this to the younger generation.They are very interested in the occolt.But I feel they are not getting enough spiritual help at home they are getting into something dangerous and need help to stay away from.Thank you this has helped alot. Thank you for explaining such a confusing issue for me. In my experience, if one even mentions the word "occult" to a Christian, they give a dirty look and say it's the devil, not explaining anything. It seems as though none of them understand how to explain, they are so full of fear and judgement. Or, they deny its credence at all, as though it doesn't exist. Neither of these responses has been helpful to me, because I have always been moderate - aware that these forces exist, but wary of lending them too much attention. I have been waiting for an article like this for ages. Thank you for putting things in order for me, I hadn't thought I would find articles like this, especially on a site like this. Luckily for me, I came upon all of these things accidentally while looking up information on Jerusalem, where I just made a friend. This will be a site I frequent more often! Discussing this topic was a refreshingly new experience.In this age of quest for a new spirituality too many get lost on the way.It is especially tragic if Jews are lured into questionable sects that make belief that they are in essence Jewish while beeing purely christian sects. Aish like all other Jewish websites should continuously warn against missionary sects and uncover their lies. Now I understand the meaning of the supernatural. Thankyou for explaining. This is a very intelligent, and yet accesible, explanation. I wish many contemporary churches could use such a forthright explnations for their youth. Your article entitled "Witchcraft & Judaism" was an accurate, yet, informative display of "internet spiritual warfare", (not unlike the confrontation Elijah had with the prophets of Baal). As a Cristian living in western civilization, I am aware of the constant bombardment Harry Potter and the Blair Witch Project tales, (both, which have undermined and misrepresented God's plan for individual creativity). Though these are potentially harmless "thrills of excitemtent" to the masses, I believe they do, nevertheless, plant seeds within young minds that slowly errode any future resistance to the attraction to the occult. God has given each of us a special gift called "imagination".Rightly used, it becomes a teaching tool in His hands. However, an imagination left unattended by morality, eventually becomes it's own idol. I enjoyed your article very much. Thankyou. I am very pleased with your discussion of this topic. There are many Jews who were raised in a totally secular environment and who are identifying themselves now as either xtians (they erroneous think that the "miracles" that j. performed were his own power) or who have resorted to some form of atheism, agnosticism or paganism. Several Jews who are identifying themselves as pagans are posting on the Jewish Message Boards of various internet servers. Please continue to address various aspects of this topic. The general public unfortunately thinks that idol worship only means bowing down to a wood or stone statue. The *occult * is not inherently evil but there is some danger involved in being led astray. when commenting on artistic people who believe in a mystery underlying the universe, I take exception to these points: Many people who are spiritual seekers do indeed believe in God and avoid psychic phenonemena such as tea leaf reading and the like. Others are agnostic or atheist, though this would never be my choice, they live moral lives any how. I do agree if a fascination with that which is spiritual, not necessarily occult and not linked with God first and formost, there can be problems. People can be led astray. I myself was involved with Wicca and the like and moved away from it. Hear O, Israel the Lord is One. I live in accordance with Gods Will. That is the safest way to live for God knows us better than we know ourselves. This article is excellent, and it helped me better understand Judaism's attitude toward witchcraft, the occult, and superstition. I must admit that I wish sometimes that it wasn't against the Torah. That way, a Jew could turn Yasir Arafat into a vegetable. Well, the Torah does have a better way. By practicing Torah and growing closer to G-d and to each other, we can make things better. I should probably first introduce myself. I am 37 years old, a mother--and Catholic. I first logged on to Aish at the invitation of my dearest friend, who is Jewish. Originally, I thought to have a better understanding of her beliefs, and find some common ground in our spiritual lives. What I have found in the various articles is a deepening appreciation for Judaism itself as the roots of my own faith. I have yet to find a story that does not enlighten my mind and uplight my soul. I find that there is much more in common in our two faiths than I ever realized--for me, a tremendous blessing. Rabbi Ahron Lopiansky in this article has truly emphasized the Divine power exacted over the entire of the universe, and how no place is devoid of the Almighty's Presence. He has utilized this in order to distinguish the idolatrous magic of Near Eastern and some Western cults from the Divinely sanctioned powers endowed to the great men and women who have represented Judaism for millenia. Yasher Koach! As ajew who is slowly returning Aish HaTorah and its techings are educating me every day. I am studying with two Rabbis and learning my way each day. Thank you for all you do to help people like me.